Performers include: Scott Bakula and Dean Stockwell. Created by Donald Bellisario, this TV show centers around a scientist from who gets lost in time after an experiment goes awry. His only constant companion is a hologram of his friend who can offer him advice and and historical context via a handheld computer. Sam Beckett (Scott Bakula) leaps into the bodies of certain troubled people. He doesn’t know anything about them and also doesn’t have much memory of his own life since traveling through time causes Sam’s brain to become “swiss-cheesed.” To all others living in that time, he appears to truly be that person. They can’t however see his best friend, former astronaut Admiral Al Calavicci (Dean Stockwell), who travels to each destination along with Sam in the form of a hologram. It’s Al who provides Sam with most of his information, filling in the holes of the person’s life where he can. Together, they try to figure out why Sam has leapt into a particular person and what he needs to accomplish or change so that he can leap again. They’re never sure exactly what problems need to be solved and just keep trying until Sam leaps out of that person and into the next, in a different time, a different place, and a different person. Their hope is that his next leap will bring Sam home. It’s unknown exactly what force keeps guiding Sam in his leaps through time but there seem to be some rules. Sam’s time travels seem to be limited to the years of his own life, roughly from the 1950’s to the 1980’s. While he can change minor points in history, it doesn’t seem that he can change or prevent major events. Some of Sam’s more interesting adventures include leaping into a very pregnant young girl, a trapeze artist, an elderly black man in the pre-Civil Rights South, an actor while onstage, a chimp in the space program, a blind concert pianist, and even a teenage version of himself. Sam leaps into a bar in Cokeburg, Pennsylvania. After purchasing a beer, he’s shocked to see his own reflection in the mirror. He is himself and has leapt to the date (August 8, 1953) and minute of his birth. He meets people who look like people from his past leaps but they have different names. Al the bartender (guest Bruce McGill) seems to know all about Sam’s mission and his actual identity. Meanwhile, in the future, Al and Gooshie (guest Dennis Wolfberg) are shocked that no one is in the waiting room. They try to find a way to locate Sam. Later, Gooshie tells Al that they should be able to find Sam’s location in about a month. Al gets very upset and Gooshie tells him they should be able to do it in two and a half weeks of Al using Ziggy in the Imaging Chamber. Al gets into the chamber and they begin their search. While Sam tries to figure out what’s going on, there’s an accident in a local coal mine. There are two trapped miners and he ultimately helps save them. Another man who helped save them disappears and no one but Sam remembered that he was there. It turns out that the man Sam had seen was actually someone who had died 20 years earlier. In the Imaging Chamber, Al is getting disoriented and for some reason knows they need to start searching Sam’s birthdays. They do but have no luck. Exhausted, Al realizes that they searched his birthdays but missed the date of Sam’s birth. He goes back to the Imaging Chamber. Al the bartender helps Sam remember that he built Project Quantum Leap because he wanted to help right the wrongs in history, but not one life at a time. The bartender tells him he’s affected far more than a few lives and can help a lot more. He’ll only continue leaping as long as he wants to do so. Sam thinks the bartender has been sending him through time but is told that he himself has the power to control his leaps. Sam replies that he only wants to go home but can’t because he doesn’t control his own future. The bartender tells him that he can go anywhere he wants and can go home once he accepts that he controls his own destiny. Al finally finds Sam in the bar and they talk outside. Sam tries to explain his revelations and Al starts to think he’s lost his marbles. The dead man who seemed to leap sounds exactly like Al’s own uncle of the same name. Concerned for his friend, Al says that he’ll find a way to get Sam out of there and returns to the Imaging Chamber. In the series finale’s final moments, Sam transports back to Beth’s home in 1969. She’s scared but Sam tells her that he’s a friend of Al’s and that Al will come home. She cries tears of joy and a picture, which had originally shown a Vietnam-era picture of Al, is flooded by the blue light of leaping. Text on the screen tells us, “Beth never remarried. She and Al have four daughters and will celebrate their 39th wedding anniversary in June. Dr. Sam Beckett never returned home.” We are then shown an image of Sam and Al in front of the diner. The credits roll over a vintage picture of a man with a young boy, standing in front of a biplane. A somber version of the theme music plays. First aired: May 5, 1993. There were discussions with the Sci-Fi Channel in 2002 about Bellisario creating a pilot movie for a new series. This would have revolved around a female doing the leaping. Bakula later indicated that he likely wouldn’t be involved. 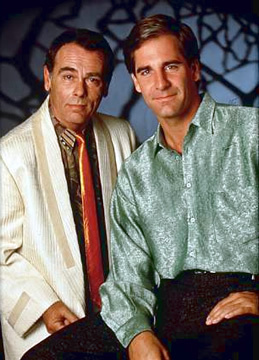 In 2004, writer Trey Callaway said that ideally the project — Quantum Leap: A Bold Leap Forward — would reunite Bakula and Stockwell and introduce Sam’s daughter, Sammy Jo. Bakula was in the midst of shooting Star Trek: Enterprise so it was assumed that he wouldn’t be available beyond that. In the movie, Sam meets Sammy Jo when she’s 12 and we then see her as a college student and Al is her professor. He’s been keeping an eye on her. At some point, she would become a leaper and Al would help her, possibly in search of Sam. The project was never made. In 2007, Quantum Leap co-executive producer Deborah Pratt was shopping her own feature film version of the project called Quantum Leap: Time Child. The project would have continued the original series’ story and also included Sammy Jo (a character created by Pratt during the TV show’s run). In 2008, Bellisario reportedly put a stop to her plans because he owns the rights to make a new pilot. In 2009, Rasco Films produced a fan-film in which Sam tries to save Lady Diana; Quantum Leap: A Leap to Die For. Pratt reprised her role as the voice of Ziggy, the computer. In 2009, Bellisario was again in discussions with Sci-Fi (now Syfy) to revive Quantum Leap. Some online videos show a misspelling of Sam’s last name (“Becket”) on the final card. However, it was spelled correctly on the original broadcast of the series finale. Many viewers have expressed sadness that Sam never returned home. However, in looking at the scenes leading up to the final moments, it becomes apparent that this was Sam’s own choice. Due to licensing issues, “Georgia on My Mind” by Ray Charles was replaced for the “M.I.A.” episode on the season two DVD set. Fortunately, it was retained for the emotional series finale scene on the season five DVD set. The last episode was not originally intended to be the series finale. It was believed that there would be a sixth season and the ending had to be changed to close the story somehow. I still can’t believe Sam chose to leap on over his leap home. I cannot find the final episode ANYWHERE! I have read what happpened and seen a clip, but that’s it! Heard it was on Netflix, but nope! I would love to see at least a mini series to truly conclude Sam’s journey…. Please bring it back! Continue the episodes of Quantum Leap. I would love to ser Sam Beckett again, Awesome show!!! Bring it back!!! Yes my mother and I used to watch this show religiously, and we both feel disappointed that Dr Becket did not return home from his leaps.and yes we agree there should be a movie (even made for TV serirs movie if need be ) be made to show all the supporting fans that Dr Becker finally leaps home. Please do something like a mini series while they are still able to do so! Lots of old stuff is being done! Do it!!!!!! Quantum Leap’s final episode was confusing, and a little downbeat. But I don’t actually think it was an awful ending. The fact that he would never leap back was kinda upsetting, but at least a rather original climax. That is, having Sam get home would have been pleasant yet predictable. I was interested to read the plans for a modern update on QL… I guess we’ll have to wait and see! That’s an interesting theory you have. I haven’t finished the series yet, but I can definitely tie your theory into it. I watched it when I was like 7/8 years old and I loved it! I watched it again at 28 and I loved it!! Why they had to cancel? And whyyyy didn’t let Sam go home?? Loved the show immensely. Hated the ending. Well if I remember the show correctly, Sam doesn’t know he’s married. After he went back into quantum leap in that episode he lost all memory of them being married and went back to his “Original timeline memory”. Sad but true, I usually just modify that one episode slightly so that they aren’t married and she married the first guy she ran away from instead. That way Sam quantum leaping for eternity feels more complete. As a scientist myself I know I would choose to do the same, to endlessly learn and experience the world and all timelines.